We are certified chocoholics over here, which is super fun when it comes to trying out yummy, new recipes, but less so when none of our pants fit. The good news is, we’ve got a healthy, dairy-free, chocolate pudding for you that doesn’t have any of the added sugar, milk or artificial ingredients. Even better, this recipe takes just 10 minutes of prep time and uses fresh ingredients! 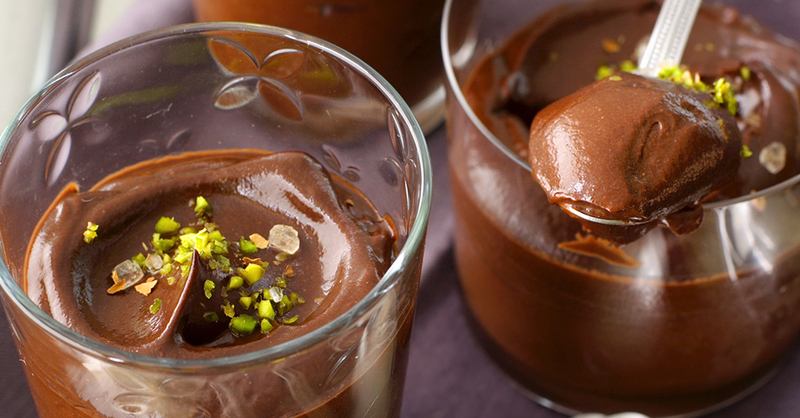 The secret to this pudding’s creaminess is…avocados! This is the perfect dessert for people with lactose intolerance or if you’re watching your waistline. Top with dairy-free whipped topping, sea salt, or your favorite sliced nuts, but just make sure you try it out! Once you taste this avocado chocolate greatness, you may never go back to the traditional version…. Combine avocados, honey and coconut milk in a large bowl or mixer, and blend together. Gradually mix in cocoa powder until fully incorporated, then pour in vanilla extract, cinnamon and nutmeg. Taste and adjust seasoning, if necessary, and refrigerate 1-4 hours, or until chilled. Serve garnished with whipped cream, sea salt, or slivered pistachios or almonds. Enjoy!